Rangefinders’ influence on the game Top 5 Golf Rangefinders. Golf was always known as a sport for gentlemen, which represents class and grace in their true forms. The elegance of this game is usually given by the equipment, most often the golf players being dressed in black or white, wearing a polo shirt and elegant trousers. The grace of the movement while hitting the ball, and the precision of the hits, also characterize the golf as a complex and impressive sport. Usually, there are not so many pieces of equipment needed, for someone who wants to play golf as a hobby. There are needed some quality clubs, some comfortable shoes and skill. But for the professional golf players all around the globe, there is more. With the advances in technology, the golf was affected too. Now, a player can use a so called rangefinder, in order to determine the distance of the hole that he is trying to target. This is the basically use for a rangefinder, but with the new improvements, there are a lot of features added to this device, making the life of the golf players easier. Here, there is a list of the newest and most used rangefinders that populate the world of golf in the present moment. There are some key features implemented on this version of Bushnell Rangefinder that differentiate this device from the others. First of all, Bushnell Pro X2 disposes of a Dual Display Technology, which allows the user to switch between a bright red tendency of the display and a sharp black version of it, depending on what he prefers, personally or on the weather conditions, more precise, lighting conditions. Also Pro X2 implements the JOLT technology which assures the golfer that the target was perfectly acquired by giving him two short vibrations when the laser locks onto the flag. There is also, the technology of slope compensation. In general terms, this technology can be translated as distance compensation depending on the declination, respectively inclination of the hole targeted by the user. This slope technology can be turned on and off whenever the golfer wants to. Another important feature for this rangefinder is that it is waterproof, so it can be used anytime. This type of rangefinders is perfect for the beginners and for the casual players. Despite the fact that is one of the last generations of rangefinders, being one of the most advanced models of its kind, he is preferred more by the beginners. Its magnification power is the biggest one on market, this device being capable of magnify the image up to 7 times. This impressive feature allows the player to lock the target even more precisely and to ease his work in trying to hit it. The bulky size that this rangefinder presents is also a plus, as most golfers complain, usually, of the trickier dimensions of the other rangefinders, saying that they find those devices hard to hold. So, by its shape, Pro X7 is a favorite among golf players, being easy to hold. As the Pro X2, this version also benefits of JOLT technology, and above that this one has incorporated the VDT technology, which gives the user the clear readings in red color, so a sunny day will not present a problem in trying to understand the readings. The VPRO500 range finder, manufactured by TecTecTec, has an impressive capability of measuring the distance up to 540 yards, with only +/-1 yard error. It will not only measure the distance to the flags, but also trees and other obstacles that may stay between the player and its target. The zoom power of this rangefinder can reach up to 6 times magnification. A feature that may present interest to players, and which is not always present on rangefinders is the Diopter Adjustment. No matter that the user is either longsighted or nearsighted this technology of the VPRO500 will always display a clear image for the player, making his attempt of reaching the target even easier. Along with the Pinseeker JOLT always present technology, this rangefinder comes also with a Continuous Scan Mode which allows the golf player to check the distance of the hazards, and a First Target Priority Mode, which permits to measure the distance to the closest flag, when there is a background full of grass and trees. This version of the Bushnell Rangefinders is one of the older ones, but it had a big impact on release. When this was first published, it was one of the first rangefinders that would dispose of the Pinseeker JOLT technology, becoming a revolutionary rangefinder. 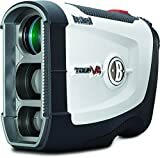 Besides that, the Tour V4 rangefinder can be easily characterized as one of the rangefinders with the highest quality on the market, as it is produced by the #1 Laser Rangefinder producers in the entire professional golf world. Also, this device comes along with a two years warranty, so the user can be sure that it will not present any defects in the first two years of usage, after the day of purchase. It is also allowed to be used in the tournament plays. The enumerated qualities make from the Tour V4 rangefinder from Bushnell a perfect acquisition for the beginners who want to get accommodated with such a device. line of products from Nikon. By its shape and weight, this device allows the user a quick learn of its usage, and by doing so, it promises more accurate measurement of distances, no matter what, and also gives the player the opportunity to understand and learn the game a little bit better. Coolshot 20 also implements the technology of the First Target Priority Mode and Continuous Measurement. Its continuous measurement lasts up to 8 seconds. And again, a perfect feature for the professional players of golf is that this rangefinder is waterproof so it can be used in any conditions. Besides that, the material is also durable, so it may survive to some hard hits or falls, but this does not ensure a well-functioning if it is dropped at every use. To sum it up, on the market, there we can find a lot of rangefinders, with different features implemented on each one, depending on the purpose of use or on the style of play. The conclusion is that everyone can acquire a rangefinder, even if it is just a beginner, or a professional player, as these devices will always help to improve the game. For the last decade or so golfers from all over the world and with a variety of different skill levels (including Tour Pro’s) have been turning to Golf Range Finders to help them with lowering their scoring, improving their course management and generally get more accuracy and fun out of their game. So What is a Golf Range Finder? One of the biggest challenges that golfers face is accurately judging the distance to their intended target, and this is where golf range finders come in to play! In a nutshell a Golf Range Finder is a handheld device that uses an eye friendly laser beam to generate an accurate distance measurement to the target it is aimed at. Similar to telescopes they have a viewfinder which you look through at one end and a lens at the other. The obvious difference between the two is that although most golf range finders have a zoom magnification capability, their main objective is to report accurate distance measurements to the targets they are pointed at. They achieve this through using advanced circuitry that calculates the length of time it takes for the laser beam to reach its target and return back to the unit. From these readings it is then able to produce accurate distance results. How effective and accurate these results are, will obviously depend on the technology used by the individual manufacturers, and there are many different manufacturers to choose from, with some of the main leading brands being Bushnell, Callaway (Nikon) and Leupold. These manufacturers offer an excellent selection of rangefinders, with each of them having their own unique technologies and specifications to offer, and you will find that they also come in a variety of shapes and sizes, and have their own different designs and styles. Some of them are horizontally orientated and look like a pair of binoculars, which tend to make them bigger and heavier, whilst others are vertically orientated and are normally smaller and lighter. As you may already be aware, there are two main distinct types of technological innovation available with the golf range finder device? One can find GPS designs and also laser beam units. You will discover benefits and drawbacks with each of those kinds. Make sure you get to know the two systems prior to making a decision on which sort most effectively satisfies your requirements. GPS devices take advantage of the global positioning system (GPS) to ascertain the place that the golf player is situated relative to the pin they’re currently on. GPS devices have the ability to present you with a great aerial view of the course, and also ranges to the front, centre and rear of the green. Having said that, they aren’t as precise as the laser dependent types. One appealing factor which they’ve got above the laser types is they aren’t relying on direct line of site. As these kind of systems acquire data from GPS geostationary satellites, they areeffective irrespective of the landscape you’re in. Slopes and inclines will not be an issue. An important downside of the GPS styles is that not necessarily every golf course has already been mapped out at this moment, nevertheless an astonishing quantity are mapped and ready to go. Furthermore, you need a regular membership to download the data for each course and also accessibility to a pc to upload the mapping to the unit. Typically this service plan is actually very cheap..
An additional possible disadvantage to GPS products is that often awful weather conditions can impact them detrimentally. Then again, for the majority of golf players poor climatic conditions signifies they will not turn out to be actively playing, so perhaps it’s not truly that significant. Laser Golf Range Finders Stated above, laser beam devices certainly are a very different concept from the GPS systems. Laser devices utilize a laser beam to focus on a particular target plus determine its yardage relative to the device. Employed properly, these types of products are incredibly precise, way more even compared to the GPS devices. Because these devices take particular measurements while you employ them in real time, they don’t need a data install of the course maps and other related applications. Similarly, they are effective on every golf course, irrespective of whether it was mapped for GPS applications or otherwise. The single most important drawback with the laser-based range finders is simply because they tend to be fully reliant on line of sight measurement. The actual laser beam is only able to evaluate precisely to a location that the laser will be able to get to in a direct line of sight. Therefore, in rough terrain, they may be of restricted effectiveness. Golf is the game where players have to measure the distance of their goal. But this is perfectly done only with experience and practice. Yet, we see that many players after years of practice can not measure the right distance. Therefore, if you want to find the correct length of your golf goal, you can do it with rangefinders and golf GPS units. With the aid of the rangefinder, you can now know the correct distance of the flag at the touch of a button. There are several advantages of the golf ranges available on the market. These devices are very useful for golfers. The devices designed the technology so that golf players can measure the meters from the driving range or golf course. Golf GPS and range finder are available on the market in large quantities. To get an idea of ​​what’s best for you, try reading magazines that contain detailed information or find them online. For a particular telemeter, you can check your qualifications and customer reviews online before finally buying one. 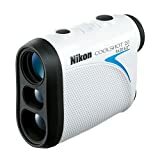 To purchase an appropriate range finder, you can consult an expert advice to get a knowledgeable detail on the subject. This will also help you avoid any kind of confusion about things. The best part of these devices is that they are very easy to use. The devices are also very fast and can measure long distances in seconds. In fact, they are better than GPS systems. Advanced computerized and optical technology is used to find the distance of the targets. Even if the lenses are partially dark, the cameras measure the correct distances. To find the best rangefinder for you, there are several things to consider. The first thing you need to know is your own level of talent. Choose the rangefinder according to that. If you are a tournament player, the device differs from the handicap and the casual player who plays for the kicks. Considering all things in mind, get a rangefinder that is best for your needs and your budget among the many rangefinders you can find in your neighborhood. To buy a range finder, you can visit a nearby market or order it online from one of the leading online shopping portals. Online websites offer attractive prices with great discounts and, therefore, are cheaper than those found in stores.